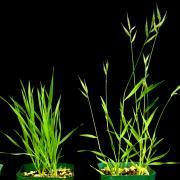 This venture will create a collection of grass transcription factor genes to facilitate energy crop research using the model system Brachypodium distachyon. Transcription factors are proteins that regulate gene expression, and the B. distachyon transcription factors targeted in this project are implicated in grass cell wall biosynthesis and the regulation of growth and biomass accumulation. Samuel Hazen and collaborators Todd Mockler at the Donald Danforth Plant Science Center and Steve Kay at the University of California San Diego will use this project as the cornerstone of a new high-throughout platform for analyzing protein-DNA interactions for the purpose of understanding important traits in grass species.